Our motto is: ‘More market in aubergine cultivation’. The aubergine market has potential. 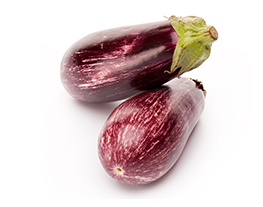 The popularity of the aubergine is low, but is growing steadily. More households buy aubergines and the consumption per household increases. 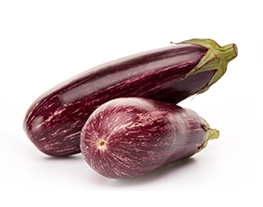 In the Netherlands, no more than 270 grams of aubergine are eaten per household per year. Italy, on the other hand, consumes 6 kg per head of the population. The Greeks eat 8 kg per year and the Turks 13 kg of aubergines per head of the population. 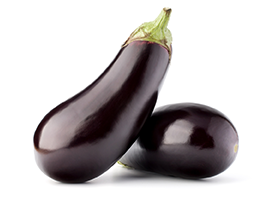 The aubergine is the least high-calorie vegetable that exists since it contains no more than 18 kcal per 100 grams. Our aubergines are sorted and packaged after the harvest on the same day so that they are transported as fresh as possible to our customers. The aubergines can be delivered in five different weight grades, we are also able to package them in different ways such as flow pack, single-layer packaging and various other types of packaging. We cultivate both the standard type of aubergine, the purple one as everyone knows, and all kinds of other types such as the Graffiti and Japanese. More information about our product and cultivation association Purple Pride can be found at www.purplepride.nl. All sales go through Purple Pride. 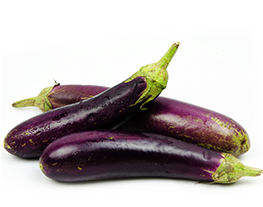 We call it the standard aubergine, but the Purple Pride standard aubergine is anything but standard. The Graffiti aubergine owes its name to its strikingly striped appearance. In addition, it has nice, white flesh. Just like the Graffiti, you can recognise this aubergine by its strikingly beautiful striped appearance. Very popular with chefs due to its small size. Its ‘roots’ are in Japan, where this aubergine is very popular. It is characterised by a deliciously sweet, aromatic taste.